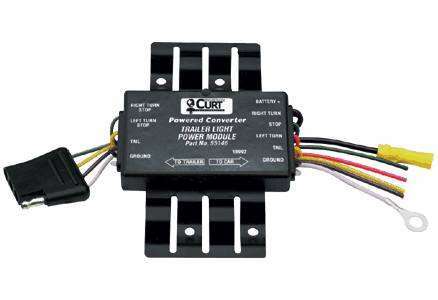 This powered converter adapts import and domestic vehicles with separate turn and stop lights (3-wire system) to standard trailer tail light wiring (2-wire system). The unit is powered directly from your battery, elminiating the current draw from your vehicle's stop/turn light circuit. This protects your vehicle's sensitive electronics, ensures that sufficient current is available to the trailer, keeps the trailer lights burning bright, and allows vehicle bulb-out detectors to function properly. This 4 Amp unit is CURT's light duty model. It is ideal for light duty trailers. Trailers with running lights and additional lighting should upgrade to either the 10 amp or 20 amp version. This unit is manufactured with Surface Mount Technology to ensure the longest product life, brightest trailer lights, and better mechanical performance under shake and vibration conditions that are common during towing. You can calculate your trailer's current requirements using the following approximations. Simply figure out how many of each light type you have and add up the total current draw to select which model you need.